All non-essential Council services will be closed from close of business Friday 23 December 2016, reopening Tuesday 3 January 2017. This includes Council Customer Service Centres and all mainland libraries. Bin collections during the holiday season will continue as normal. For emergencies including road repairs, fallen trees and water supply issues please call our after hours emergency number 07 3829 8999. • Redland Art Gallery, Cleveland will be closed from Sunday 25 December 2016, reopening Monday 2 January. Redland Art Gallery, Capalaba will be closed from Saturday 24 December 2016, reopening Monday 2 January. 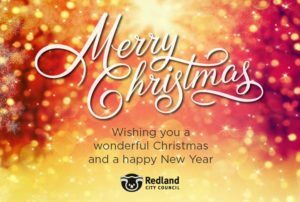 • Redland Performing Arts Centre Box Office will be closed from 4pm Friday 23 December, reopening at midday Monday 9 January. Tickets can be purchased through the RPAC website during this time. • Redlands IndigiScapes and Visitor Information Centre (including Tea Garden cafe) will be closed Christmas Day only. • Waste transfer stations will be closed Christmas Day only. Waste collection services will continue as usual. Please make sure your bins are out the night before. • RecycleWorld will be closed from 23 December 2016, reopening Thursday 5 January 2017. • Animal Shelter will be closed Christmas Day only. Limited hours apply (9am-12pm) from 24 December 2017 until 2 January 2017. Normal hours resume Tuesday 3 January 2017. • Home Assist Secure will be closed from 4pm Friday 23 December 2016, reopening at 8am Tuesday 3 January 2017. Posted in Council, Uncategorized and tagged Christmas, new year.